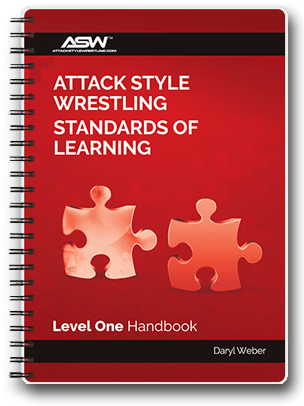 4 DVD's full of the foundation techniques, drills and live practice scenarios EVERY wrestlers needs to master. 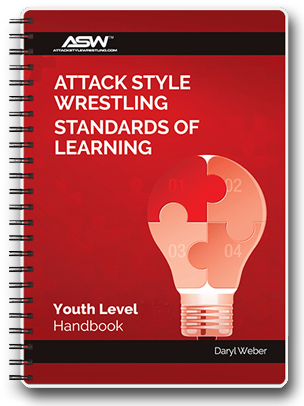 It also comes with the Standards of Learning Level One & Youth Handbook which includes a full technical outline, 17 Practice Plans, and a skill test that will let you know if your wrestlers are learning. But, once they’ve passed the skills test don’t think they can move on and forget this stuff. These DVDs are full of the skills that need to be revisited regularly throughout a wrestlers career. 4 DVD's full of the foundation techniques, drills and live practice scenarios EVERY wrestlers needs to master. 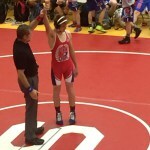 Reveals the most important techniques to focus on for beginning youth wrestlers and team and lays the perfect foundation to lead straight into our Level One SOLS! 14 complete A-Z practice plans you can use to run your entire season or as templates for any existing system you may have in place. 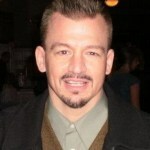 Ends with a straightforward TEST you can give each wrestlers. 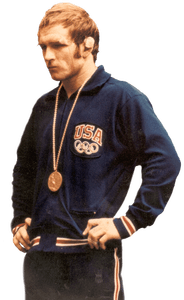 This is a great way to motivate wrestlers to actually learn the techniques and incentivize development in even the youngest athletes. Each level comes with an outline of techniques presented in a systematic fashion that will be mastered for that level. This handbook is perfect for youth beginners and rec leagues. It will show you the techniques, give you complete practice plans and ends with a test you can use to check retention of the skills presented in this Youth Level SOLS Handbook.